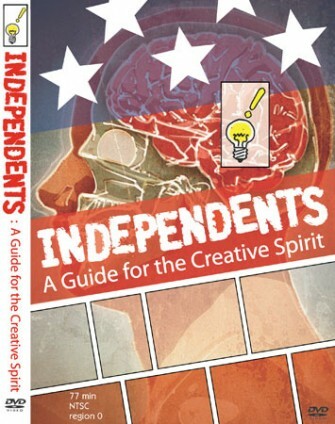 I recently watched and enjoyed Independents: A Guide For The Creative Spirit, a video documentary by director, writer and '90s mini-comics mainstay Chris Brandt. It's told with a greater degree of subtle, visual skill than most first-time documentaries, and instead of working too hard at trying to communicate the entirety of modern comics or strain to make a case for a movement within it, Independents focuses on creativity and the impulse to pursue art in a way that I think greatly helps in keeping the film from drowning in specifics. Brandt cast a wide net when it came to his interview subjects -- there's one artist with whom I'm completely unfamiliar, and a few I hadn't see speak at length before -- and deftly handles the background information by borrowing approaches to graphics that worked in other documentaries. So if you want to see a cross-section of articulate artists and comic book people talk about making art and creativity for a while, I'd say it's more than worth your $15. It's full of small pleasures, like Tony Millionaire talking about S. Clay Wilson, and supports repeat viewings in the manner of one of those pledge-month shows that pop up on PBS that you don't mind having on over and over while you clean up the living room and cook Sunday dinner. The extras are pretty decent, too, including extended chats with body-of-documentary casualties Johnny Ryan and Ron Turner. I enjoyed speaking to Chris Brandt, whose comics I've read but I'd never met. TOM SPURGEON: I was surprised to read that Independents came out of the San Diego con video you made for the Independent Film Channel a while back [Comic Con Chronicles -- 2005]. As I recall, you participated in that contest as a way to promote the fictional short film you had done and were showing at the con. CHRIS BRANDT: Closing Time, yeah. SPURGEON: And the story goes that during the course of putting together that video, you did a couple of interviews that stuck with you? BRANDT: One in particular. When I was interviewing Batton Lash, he was talking about something that didn't end up in the documentary at all, but sparked my thought processes. He was talking about how -- maybe it does get mentioned in the documentary -- how mainstream comics aren't necessarily really mainstream. The distinction between mainstream and independents or alternative in the comics industry doesn't hold up to what's on television or in film. It's a topsy-turvy definition within the comic book medium. That spurred my thought processes, and things kind of grew from there. SPURGEON: So at what point does this curiosity based on this one question coalesce into a documentary-length commitment? BRANDT: I was at a small film festival in Georgia; it was my first one. I was trying to go and see as many different films as possible. I sat through a couple of documentary films, or videos, I guess. They had very interesting subjects, but they depended on the subject matter to kind of carry it through. I was down on documentaries and thinking, "It's not that hard to do a documentary right." The devil's voice in my head said, "You think it's that easy, show us." I went from there. It really blossomed in a five minute period. My immediate thought was, "Well, if I'm going to do a documentary, what would it be on?" The obvious choice for me was comic books. I'd been doing them for ten years, and studying them and reading them beforehand. I didn't know anything about comic books, but if I knew anything about anything, it was comic books. I had small connections within the field itself, having done mini-comics and gone to conventions and associated with people. I had a lot of friends. I thought, "You know what? I'll take a video camera, shoot this thing in three months, interview my friends, and slap something together that epitomizes the mid-'90s mini-comics scene that really wasn't covered at the time." Half of the people I asked turned me down. People I thought would be interested in talking about their art work, weren't. [Spurgeon laughs] So it grew from there. But the questions themselves came from that initial five-minute conception. I knew what questions I was going to ask no matter who I was sitting down with. It really progressed from the exploration of what being independent is, what being an artist is, about comics art itself. It coalesced into that final question of the documentary, of "Where do ideas come from?" When I came to that question I knew that that question had been asked of people throughout the ages. You sit down to an author doing a reading at a bookstore, or a director/writer standing in front of his film. Someone will inevitably ask, "Where do you get your ideas?" or "Where did you get the idea for this?" It's a tough question. It's kind of poo-poohed in the creative community. You see that in the documentary where a lot of people were brushing it aside. "It comes from my head," or "Ideas are everywhere, what kind of question is that?" But I think it's the fundamental question that people that aren't involved in the process wonder: where did that come from? I was surprised when that was the ultimate question my brain led me to, a question I'd been aware of, and aware of the negative associations that people had with it. SPURGEON: Now, that question is something you could ask of any artist. But in this film you ask independent artists. Why that question for that group? BRANDT: I think they're the closest to the answer. I think once you find someone deeply involved in the commercial aspects of it, they might not be as attached to the ideas as they espouse to be. I knew I wasn't making a five-hour series for PBS. I really had to condense down and get to the meat of the subject. The documentary itself is -- as much as it's other people's words -- it's really about my conception of creativity and the comics medium itself. People didn't necessarily have the same answers. My initial concept was to play off of film and comics more, kind of explore that. I was struggling with why I was choosing film over comics. Film was my first love, but I started doing comics because I knew film itself involved a lot of other people and therefore had a lot more compromise necessary. Or at least one needs to be able to talk to people effectively to get their ideas through. I hadn't achieved that in my personal life, so I did comics, because that was the only way I could express myself visually. Initially in the documentary, the film and comics comparison was a little stronger, but eventually I dropped the film stuff out and went solely with comics. SPURGEON: Were you sympathetic to any of the artists' answers? Was there anyone's answer you thought was close to your own? BRANDT: You mean any particular person? SPURGEON: I guess I'm asking you where ideas come from. And if your answer was in the film at all. BRANDT: It was, but kind of subliminally. I don't know that anyone can definitively say where ideas come from. It's like asking if there's a God. To me the answer is God, but what is that? I don't know. Is it an entity? A free-flowing river? An abstract and impersonal source? Craig Thompson and Shannon Wheeler probably hit on it best for me when they described ideas as being out there and flowing through you. It's not something that automatically happens, because as other people in the documentary say, the more you work with them the more is generated with them and the more you're able to tap into whatever that source is. It sounds kind of fruity, but that's the best answer I can come up with. SPURGEON: One thing that impressed me about the film is that the entirety of independent comics seems represented -- if only by smoke and mirrors. [Brandt laughs] You seemed to use a pretty wide array of artists and cartoonists. Was that on purpose? BRANDT: Yeah, definitely. I was looking to get a person as far back as possible and as new as possible that I could get access to. I also wanted people whose art I could get into, so when I sat down with them I would be invested in the conversation. I needed to like the person's art work and be invested in the totality of what they were doing. SPURGEON: Another thing that struck me about the film is a moment you left in with Gary Groth, where in the middle of an eloquent point he gets an intercom message, and he sort of stops and rolls his eyes [Brandt laughs]. It's a funny moment of his to have captured on film. Was there a desire on your part to get a snapshot of cartooning: Tony [Millionaire] in his back yard, Gary in his office, Linda [Medley] at a convention... Did you think about that element at all, or were you just going by wherever you could get an interview? BRANDT: It's a combination of the two. I grabbed people wherever they were available. Gary asked, and I said his office, and he said his office was kind of dirty, and I wanted that. I wanted something that represented them. Trevor Alixopulos is talking on a loading dock outside of APE. That seemed to really represent him, a truly underground artist. SPURGEON: How many interviews and interview subjects did you have that you weren't able to use? BRANDT: I had about 40 hours of interviews. Did you look at the extras? BRANDT: There were some people there. Terry Moore... Ron Turner. Then there were people I couldn't even get in the extras. Jennifer Daydreamer, and Sam Henderson. I really like Sam a lot and some of the things he said were genius and weren't covered by any other people. But they didn't come out in a fluid enough manner, and he wasn't comfortable enough in front of the camera. I really wanted to have a film where someone who wasn't into comics at all, and came into it looking for an uncomfortable person to label as a geek, wouldn't be able to say: "I knew that's what this was about. I don't have to listen to that." I was very conscious of thwarting preconceptions an audience might have. It was a propaganda piece in that way. Are you familiar with the film What the Bleep Do We Know?" BRANDT: That was done by a religious sect in Oregon. I knew when I was watching it that it was propaganda of some sort. I wanted to make this accessible to people who don't give a damn about comics. Even if the guy's name is Frank Miller -- if he's talking about the pen he uses, the general public isn't going to be interested in that. I tried to straddle both worlds. I wanted to make it of interest to comics audiences but also try to grab that wider market and bring some people back into our medium. SPURGEON: Now you've shown this in festival, right? BRANDT: No. Comic-Con in San Diego turned me down sight unseen. SPURGEON: [laughs] Do you know why? BRANDT: Apparently, they were getting so many requests for screenings that they turned everybody down whose names didn't end in Universal or Fox. I can understand if they didn't want to show my documentary in Hall H. But when Fox drops out and you decide to show a festival of trailers to fill that time...? I'm a nobody, I know that, but I think my feature-length documentary is better than ten trailers you can see on the Internet. SPURGEON: You're early in the process, then. BRANDT: You'll be one of my first interviews. I just did a public access interview, and Jonathan London at Geekscape.net allowed me to co-host and we had a brief discussion about the documentary. SPURGEON: This is kind of a digression, but I'd love to ask you about something said earlier. You started out with the intention of doing something on the 1990s mini-comics scene. What is it about that scene that you found interesting enough to want to do a film about it? BRANDT: I was involved with it for part of it. So I guess there was that egotistical part of it. This was something I did, and I wanted people to know about it. It's obviously a part of the 'zine movement, the punk rock 'zines of the '80s, which itself is a stemming off of the self-publishing movement. It really all goes back to Help! and Harvey Kurtzman and those guys putting out their stuff. It was what I knew about. It was something that like you said you hadn't seen other people talk about. Here I am. I'm talking about comic books. What do I know about comics books? I know mini-comics. Distilling it down to what I know best. SPURGEON: Was it the artistic accomplishment that you find unique about that period? The number of artists? SPURGEON: When I saw her say that, I was thinking if Jessica had been doing those same comics now she'd probably have a three-book deal at Random House, although maybe on a commercial property rather than her own books. BRANDT: That's part of it. There's this incredibly complex web that is so difficult to figure out, and once you figure it out and have the energy to pursue it, that's the thing. As I thought about that more and more, the complexity of it really intrigued me. And trying to distill that into 77 minutes was really a challenge. Once I faced myself with it, I couldn't ignore it. SPURGEON: For the framing sequence you use a mix of skits with a professor about the nature of creativity, and some staged pieces. Someone is going to ask me if that professor, James Kaufman, was real. BRANDT: He's real. You can look him up. That's how I found him. A really great guy. I was fortunate in that he acted in college and has an active interest in comic books. It was serendipity. The little skits that I put in were things I wanted to do, and I think it came out of how I would make this documentary my own. I didn't want printed titles that told you what the chapter was about. I knew that it would be easier to follow if broken into segments, and those segments had to have some way of being separated. I knew I didn't want a narrator talking over everybody. I wanted this to be about the people themselves. The narrator and chapter breaks just found their own life, organically, in the process of distilling it down. SPURGEON: I liked how deftly you were able to do the history. BRANDT: Watch the extended history; it's like 15 minutes. The first version of the movie I had was 93 minutes, and had 15-minutes of dense history that was chronologically presented. Whatever peaks the movie might have, the center was this huge trough. [Spurgeon laughs] Quite frankly, distilling this thing down from 95 to 77 minutes put me into 72 hours of observation. I had a breakdown. SPURGEON: Well... it worked. Although that sounds like a horrible price to pay. SPURGEON: Are you happy with the result in general, Chris? BRANDT: I'm extremely happy with the result. I've seen it 200 times easily. I have intimate knowledge of the material that's there. I've heard those voices 200 times and I can sit there and not cringe and not wonder if it's any good. People may not like it or get it, but I'm happy with it. Though that happiness is overshadowed by the huge relief of just being done with it. SPURGEON: Another formal issue involves how you dealt with showing comics onscreen, the thing that seems to vex every comics documentary film maker. 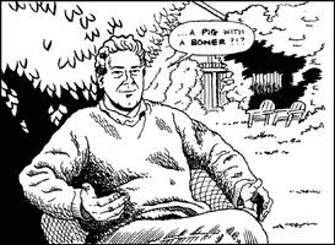 I remember a Daredevil sequence in your movie that moved across the screen effectively, and the way you displayed a few pages of Cerebus in one continuous scroll seemed to work well. BRANDT: Somebody showed me the documentary The Kid Stays in the Picture, which made me aware of the idea of cutting up the image and letting the pieces move. Changing backgrounds and letting the pieces cross themselves, or moving focus from one piece to the next. That really opened up the window. Initially I thought it would be a Ken Burns thing, where I'm panning across all the images, but that really opened up the possibilities of what could be done. Motions graphics in commercials is really frenetic; the computer industry has improved what you can get away with and what you can do. I was conscious of being subdued with it. Comic books are not animation. That's something I wanted to keep clear. I know that I used to hear, and I'm sure other cartoonists have heard it, where there's this comic that you've done and they say, "Oh, great. You should send this comic to Disney and work at Disney." [Spurgeon laughs] But I want to do comics, not animation. They're different creatures. If there's something you want to do personally and not that interested in commercially, there's a reason that is. I wanted to stay as true as possible to the nature of comics, and not have it turn into an animated piece. Subliminally get the information across, "If you pick up a comic, this is what you're going to be looking at." "Right now you're watching a documentary about comics, and you're going to see some of those elements move." It's straddling two worlds. SPURGEON: Do you have any ideas what you're doing next, Chris? BRANDT: I have a couple of my own ideas for documentaries, and Wendy Pini expressed an interest about working together on a documentary about her. She's had a fascinating life. But I didn't want to do documentaries to begin with. [Spurgeon laughs] So I'm finishing two feature scripts, and I have another feature script I'm shopping around. Right now I'm trying to balance a few things involving getting an income. Producing the DVD set me back. I'll be promoting the DVD, too. Also, Slave Labor's Eyemelt.com distribution arm picked up my Angie comic which has been re-titled Every Day is Saturday. So I'm going to do more of those. 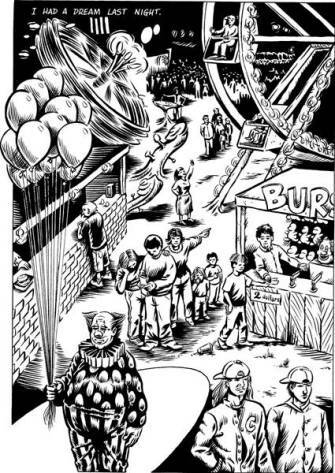 Independents: A Guide For The Creative Spirit, Self-produced Video, Chris Brandt, 77 minutes, 2007. David Glanzer writes in with a brief objection to Mr. Brandt's portrayal of CCI's film programming policies.